With its unique company culture, generous salaries and benefits, and myriad employee perks, Netflix is a coveted employer by many in the tech sector. “Freedom and Responsibility” is the ethos of the Netflix workplace and staff are encouraged to use their talent to its fullest extent to achieve great things. People look up to Netflix as a paragon of success for many reasons, among which is its unrivaled success in the video-on-demand market. In 2013 alone, its stock more than tripled, and its shows won three Emmy Awards. Make no mistake; this workplace is decidedly not “chill” and emphasizes excellence in everything their employees do. But for those who perform well, Netflix is known for its supportiveness, creativity, and inclusivity. But does it live up to the hype? Many of us forget that before it was a streaming giant known for award-winning original programs like Stranger Things and House of Cards, Netflix a simple rent-by-mail DVD service that was founded to compete with Blockbuster. This was nearly 20 years ago, in 1998. In 2007, Netflix introduced streaming, allowing members to watch television shows and movies on their personal computers instantly. This revolutionized their business and propelled them to being one of the most visited websites on earth. 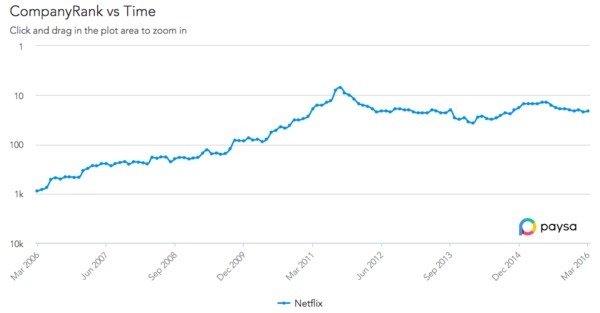 Since then, Netflix has spread globally and now boasts 74.8 million subscribers worldwide. It’s this continued success and constant reinvention that makes Netflix one of the most respected and profitable media companies on Earth. Those who have followed Silicon Valley happenings for the last decade or so may remember the famous 2009 slide deck on Netflix’s unique organizational culture. This presentation went viral, having been viewed an estimated 12 million times and influencing many organizations across the globe to up the ante with their own cultural values. This is a company that doesn’t care how much you’re in the office as long as you produce. They depend on their talent acquisition team to find the top performers across the technology sector and recruit only the best of the best. This allows the organization to function with solid, high-performing teams of “rock stars” who can get the job done without being micromanaged. (See above for more on the aforementioned “Freedom and Responsibility” ethos.) Many employees comment that despite Netflix’s success and size, it still maintains its fast-paced startup vibe and is quite unstructured compared to other workplaces. As a workplace, Netflix is famous for its high salaries and unlimited vacation time. But the employee perks don’t stop there. Netflix offers an excellent benefits package including 12 months of paid parental leave (although employees can use their discretion on how much actual leave is taken), open working hours for early birds and night owls, health, vision, and dental insurance. Healthy lunches are provided, as is a discount to a 24-hour gym. Netflix is an organization dedicated to helping not just their employees — but also their families. “We want employees to have the flexibility and confidence to balance the needs of their growing families without worrying about work or finances,” said Netflix’s Chief Talent Officer, Tawni Cranz,“Parents can return part-time, full-time, or return and then go back out as needed. We’ll just keep paying them normally, eliminating the headache of switching to state or disability pay.” With this in mind, Netflix offers both salaried and non-salaried employees unlimited parental leave. This is in-line with Netflix’s overarching culture that prioritizes allowing employees to determine their own work-life balance. However, this policy is not without its detractors. According to some, “unlimited leave” actually discourages employees from taking time off, even if it’s desperately needed, due to fear of looking like an underperformer in a competitive workplace. It is not apparent that Netflix offers benefits like bereavement leave or tuition reimbursement at this time. However, considering their history of reinvention and innovation, it would not be at all surprising if these benefits are rolled out in the near future. That said, Netflix employees are granted much more freedom than others in the tech sector. There is no dress code, with the only request supposedly being asked not to show up naked! For unique personalities who value excellence but maybe don’t jive with traditional workplace micromanagement, it’s easy to see why Netflix is at the top of many talented peoples’ dream employer lists. The Paysa CompanyRank is an algorithm that measures the flow of quality talent at a company over time. Data for analysis comes from 7.45 million job changes across 198,000 companies over the past 15+ years. Not surprisingly, Netflix is ranked among the top companies, residing in the number 21 spot currently. As you can see in the graph below, the company’s standing has steadily climbed in the past decade as they continue to improve their culture and employee offerings. Paysa SalaryRank leverages the large scale salary data and machine learning that powers the Paysa platform. Total salaries for tech talent are computed across all salary components including base, bonus, equity, and signing bonus if any. Unsurprisingly, Netflix currently clocks in at the coveted number 1 spot. Paysa has gathered salary data from 2K profiles to find an average base salary of $283K per year, ranging from $196K to $377K. This includes an average one-time signing bonus of $29K per salaried employee. Given these figures, the answer to whether employees are happy with their salaries is likely yes, but let’s explore closer some of Netflix’s top paying jobs, including salary breakdown, and information on qualifications and promotion opportunities. The average salary for a Director of Engineering at Netflix ranges from $359K to $461K a year with an average sign-on bonus of $32K. Men outnumber women in this position 4:1 and 71% of applicants must know software engineering. About half of all applicants have a Master’s degree, and 59% are white. The average salary for a Director of AD Operations at Netflix is $333K with a sign-on bonus of 20K. This salary ranges from $288K a year to $380K a year on average. The most important skill, by far is, MYSQL, with 100% of applicants being proficient. All the candidates are college-educated with half of them having a master’s degree. Engineering Managers at Netflix earn an average of $325K a year with a sign-on bonus of $31K. This generously-paid position ranges from $270K to $381K a year in compensation with a select few in seniority making upwards of $483K. Women are underrepresented in this role, with men numbering women 9:1. 45% of them are white, and only 1/3 of them have a master’s degree. However, a breadth and depth of experience is prioritized, and those who would like to pursue this position should be proficient with Cloud Computing (64%), Java (59%), and Agile Methodologies (58%). Senior Software Engineers at Netflix can command an average salary of $294K a year with a sign-on bonus of $30K. At the low-end, they earn a generous $119K a year, but some who rise in the ranks can go on to earn upwards of $430K annually. Men outnumber women 13:1 in this role, so there is room for improvement as far as diversity and inclusion go in the sense of gender, but with only 36% being White, it does show that there is some racial diversity. Those pursuing this coveted job should brush up on their programming skills, as 86% of your competition will know Java. Education should also be a priority as 72% have achieved at least a bachelor’s degree or higher. With its famously competitive salary, benefits, and other perks, it’s easy to see why Netflix is consistently ranked as a top workplace for some of the best talent in Silicon Valley. You will work hard for sure, but it’s easy to see that this organization prioritizes employee happiness and rewarding their efforts generously. Unlimited vacation, healthy meals, high salaries, and an independent spirit are just some of the reasons people love working here. And with a corporate culture that thrives on constant reinvention, it’s easy to believe that things will only continue to get better for Netflix’s employees. As Paysa’s #1 company for salary and #21 company out of thousands of competitive organizations, it’s apparent that these perks are some of what drives Netflix’s organizational excellence — by putting their employees first, they can retain top talent and deliver a better product to their end-users. However, this is not a company for those who need their hands held. Only the best will thrive in this competitive workplace, but for those who can cut it, the sky is truly the limit for earning and rewarding career success. Paysa was founded out of frustration with the lack of reliable, current, personalized information to help people navigate their careers. We provide the capabilities, the experience, and the data to help employees answer their job and career related questions in a way that is accurate, timely, and personalized to them. Planning your next career step and want to get paid what you’re worth? Visit paysa.com today and arm yourself with knowledge. Next ArticleHow Much Should You Get Paid?